President Maithripala Sirisena speaking at the funeral of Ven. Maduluwawe Sobitha Thera today pledged to abolish the Executive Presidency, a fervent wish of the late Thera. 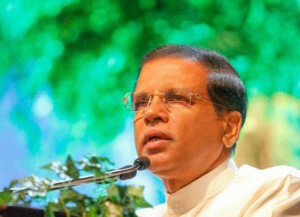 Sirisena said that he would also introduce a new electoral system with a MP for every electorate while doing away with the preferential voting system in line with Sobitha Thera’s wishes. Sirisena pledged that his government will commit to usher a just society which the late Thero had fought tirelessly throughout his life’s journey. Prime Minister Ranil Wickremesinghe, who spoke at the funeral, said that the the new government will entrench good governance in the country the Thera had hoped for. Wickremasinghe identified Sobitha Thera as a brave and selfless leader who spoke on behalf of all Sri Lankan’s irrespective any religious affiliations. Sobitha Thera is one of the key architects in galvanizing a people’s movement to defeat former President Rajapaksa and elect Maithripala Sirisena. He was instrumental in introducing Sirisena as the common opposition candidate at the last presidential poll. Cremation of the late Thera was held with full state honors in the afternoon today at the Parliament Grounds in Sri Jayewardenepura Kotte. Thousands of people lined up beside the road from Naga Viharaya to the Parliament grounds, when the funeral procession proceeded. The Chief Incumbent of the Kotte Sri Naga Viharaya venerable Maduluwawe Sobitha Thera passed away at a hospital in Singapore at the age of 73 on the 8th of November. Just Society …….. OK let us be fair. Let us start from the Rajapakshas, including the one currently in the cabinet. If there were no politicians the people would be free internally & externally. electoral system with power distributed. Was there any TNA Representatives or Leader attend the funeral, for national representation? Portuguese cafrinhas in cart before horse?? he provided a structure when they all met initially.creating the C.C. My3 is only elucidating the actions to be taken in this regard. Aiyo Sira but when? After your second term or third term? Come on, you are being serious now. Get over it. When the politicians find themselves unpopular they promise goodies they will never intend to nor will the able to deliver. You must learn to take anything politicians say with a grain of salt. I am reminded of JR’s pledge to deliver a “Dharmista” society with eight measures of free grain. Most people forget that he promised to abolish EP in the 100 day ‘yahapalanaya’ program. Most politicians have problems with mathematics. Where is your friend Dayan the self confessed war monger? Best let sleeping dogs lie, don’t you think? Boa Constrictor how is your future generation fairing aren’t they billionaires? Foolish Buddha leaving it all to the heavens and holding Mahayana to ransom. An executive president position is not good for sinhala buddhist culture just like many other like sharia law or english way of life and vis a vis. jus’ like Foolish Jesus, leaving all to Heaven and holding Bible to ransom ! It is just a wastage of money. Instead, there can be an executive prime minister. but, there should be an election for the executive prime minister. IT cannot be selected by the MPs. Executive prime minister must be one selected by the people and not by the MPs. What is the difference between the executive President and executive PM? Or is it just name change but otherwise just the same as executive President? At least in the eugolies , do not lie. Shame on you’ll politicians. CBK pledged to abolish the Executive Presidency. MaRa pledged to abolish the Executive Presidency. Now MS has pledged to abolish the Executive Presidency. This is old Music being played on an old Gramophone! Executive Presidency must be abolished by every elected President in SLto keep it going! That is the way to abolish it. Wow, if he abolishes the Executive Presidency, what is his son going to do? Sirisena should be careful of what he says ! If the Executive Presidency is abolished, Sirisena’s siblings will be unemployed !! His son will have to look out for another job ! Terms and conditions apply just as in the case of the size of the cabinet. Actions speak louder than empty rhetoric, so if Maithri is serious he should keep his promises regarding ending nepotism by replacing his siblings from the posts they hold, then clean out the parliament by jailing those who are criminals. Otherwise he will be proved to be just another useless piece of ‘you know what’! We as citizens are also giving him more importance than the PM, despite the 19th amendment and its intent. Ingrained bad habits are hard to unlearn! Why are all these Comments so Negative? Are these all ‘Sinhala Buddhists’, who want the Rajapakse Government back? Let us be Positive and Vow to Help The President to achieve His Promises, by Silencing all His Detractors and Enemies who want to Preserve the Current Status Quo. Abolishing the Executive Presidency in toto will be a difficult task. Instead, he can commence by abolishing the parts of it which make it an unwanted & dangerous piece of legislation. He can for a start, abolish the “immunity clause” – by passing a bill through parliament. Then, the power to appoint judges and attorney general similarly. Then, the power to appoint top public servants in similar manner. These will do for a start. But, I am sure arguments against these will be vociferous by not him, but by those who “live in his shadow”. Hmmmm, where have I heard that before?